NXP (Experience POints) seem easy enough to rack up if you get out in front and dominate, I have yet to play with some real tire wear and fuel and I have only been running 10% career races to get used to the game play. There certainly is not enough Caution flags even for pretty decent spinouts and crashes that is one complaint, but at least there is double-file restarts. I would also point out that the career mode really does not start you out in the Truck Series like the last NASCAR09 game did. You basically jump in as your driver of choice and start racing. There is no learning curve, custom driver/car setup like in NASCAR09 either. I will say the tracks are done very well in regard to bankings, realism, look and feel. You just can’t go full throttle and expect to win, you will need to roll off into the corners and roll back on. That was a nice aspect of the game play. Online Play needs a LOT of work! Lastly, I will have to say the online game play is initially AWEFUL! I was in a lobby with 3 people and every time a new person entered the countdown timer started back at 60 seconds. Literally it takes 5-10 minutes to finally get an online game started. Not very “Quick” for a Quick-Match session if you ask me. I am not sure if that is a bug but most other lobbies count down and just hit zero and whoever is there is in the game. Also the race just plopped us on the track, no green flag, nothing, and the controls were locked up nobody could move. Again I am not sure if this was a bug but first impressions are everything and I was not impressed. I ended up going back to career mode after one online race. The other thing is there is no black flags in online, so players can just beat and bang each other all over the track. I think this needs to be setup so that there is actual RULES to online racing. People were just sending other players into the wall and crashing them. This is NASCAR, NOT Need for Speed, it should be about driving the tracks, drafting, passing clean, just like real racing. Black Flags should go out for aggressive driving or at least have the option to setup a lobby that has it. Maybe there is but like I said I quit after one online session. Just letting everyone crash each other is plain ridiculous. 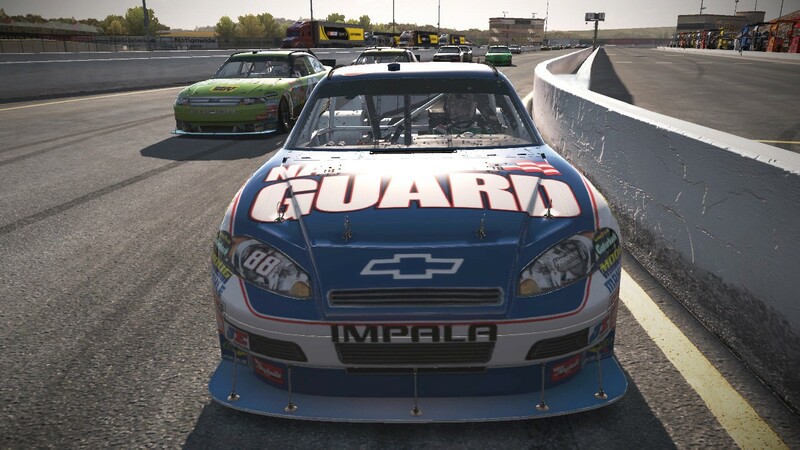 As a NASCAR fan, I like the concept and the game was fun in single player mode. I really think the online play needs a lot of tweaks to make it more like a real race without all the crashing of each other. This could also be worked into the single player game as well as I was able to just smash drivers out of my way and win the races. Not very realistic, so I will play a bit more with the settings and see if I can run real damage races and if that has any effect on the game play. Overall not a bad first stab, nut I think NASCAR licensing this needed to ensure there more more realism and less “bumper car derby” aspects of it. Do you know if the WII version is available yet? My 6 year old is a big NASCAR fan and would go crazy if I got this for him. Looks like May 24th according to Amazon. We have both PS3 and Wii, but I usually get most action games on the PS3. The family games we get on the Wii.